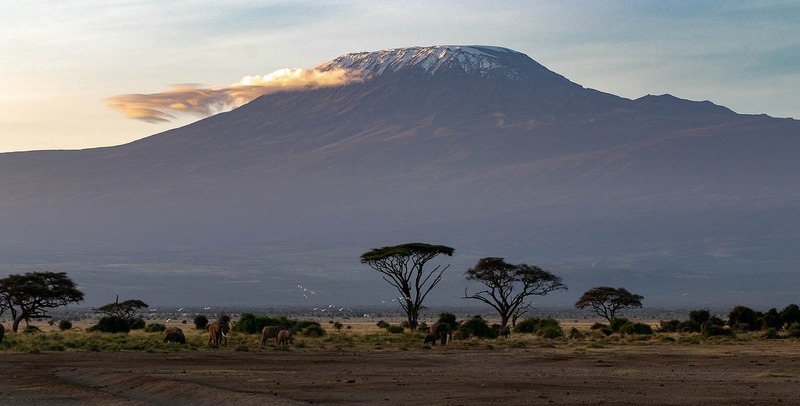 Northern Circuit Route is the newest route to open on Kilimanjaro and is a modified clone of parts of Shira and Rongai routes with a traverse to connect them. This route has also been called the 360 and Grand Traverse by some companies. The route has a very long approach to the mountain but like Shira, starts off at a high altitude, making acllimitisation more difficult initially. However, it then remains at a relatively stable altitude for two days before ascending to Kibo Camp. The route is done over 8-9 days. How long does it take to climb Mt Kilimanjaro via the Nothern route/Grand Traverse? What distance does Northern Route cover? When is the best time to climb along the Northern Route? Is the Northern approach different to the other routes? Yes very!. First of all it stats at a much higher altitude than the other routes so not advisable if you do not acclimitise well. The first few days are relatively easy going until you join up with Rongai. Summit is then via Kibo and Gilmans Point, and descent is via the Mweka route. It is also the quietest route. How would you grade the trek along Northern Route for difficulty? Day-1: Meet at Kilimanjaro International Airport and transfer to hotel. Departure from Moshi will be at around 7:30am for Londorossi gate, about 4 hours away, where you will complete entry formalities. We will then drive another 10 minutes up the road where the vehicle will drop you and team off. You will then have lunch and enjoy a short hike to Shira I at 3720m, about 2 hours away. Another option on this day is to go straight to Shira II at 3,840m making it a 4 hour trek and shorter day on day 3. You leave Machame camp and climb quite steeply for about an hour. The route then follows a more gentle gradient toward the base Shira Plateau which is actually a the remains of a caldera, or collapsed volcanic crater. Then you traverse up the rocky outcrop before trekking in an easterly direction, to Shira Camp, Shira being one of the three volcanoes of the Kilimanjaro massif. Today we head out across the moorland and into the stark alpine desert heading up a ridge off the main trail along the quite and seldom used Northern Circuit Route. The trail heads across massive beds of shale through many valleys, almost 10 in total. . The final section of today's walk is undulating until we reach the location of Pofu Camp (4150m). The views across the vast Kenyan plains that stretch out far below are incredible. From Pofu Camp we climb up to the top of &apos;Buffalo Ridge&apos; and the descend to reach a small spring and some vegetation. The trail continues eastwards through a landscape that has increasingly sparse vegetation to eventually reach Third Cave Camp (3600m) which is on the Rongai Circuit. Approx 5 hours walking. Today we will find ourselves joining with Rongai. The options on this day is to trek towards Mwenzi Tarn or Outward Bound, but Outward Bound offers greater acclimatisation chances. The route will take us along the Rongai trail towards Kibo camp, before deviating off to the right to Outward Bound Hut. Will enjoy a packed lunch and then return to Third Caves for the night. The trekking time today is 5 - 7 hours, with a steady ascent back along the same trail as yesterday, passing the route to Outward Bound. We will continue up a steadily inclining slope through areas of rock until we eventually reach Kibo Huts. An 11pm wake-up call is the start of a long trek. You begin trekking at 11.h30am up the winding path of endless switchbacks. Your final pull up to Gilmans point is the hardest part as you ascend over rocky terrain and scree slopes. From your camp to the rim of the crater (Gillman�s Point (5,712 m) to Uhuru Peak, the trekking time is about 7 - 8 hours. Today is by far the steepest and most demanding part of the climb so that we can be up on the Crater rim by sunrise. You will stop at Hans Meyer cave on the way, the famous place where Kilimanjaro's first western climber described in his journals. Once you arrive at Gilman�s Point at the edge of the crater, the trail to the summit is less demanding, and is reached after a further 1�-2 hours along the snowy crater rim. After a short time at the summit, re-trace your steps back along the crater rim to Stella Point and then descend down through Barafu Camp where you will have a chance to rest before heading down towards Mweka Hut (3100m). The camp is situated in the upper forest and mist or rain can be expected in the late afternoon. Habitat: Forest After an early and well-deserved breakfast, it is a short 3-hour scenic hike back to the Park gate. It is recommended not to pay your porters any tips until you and all your gear have reached the gate safely. At Mweka gate you will have to sign your name and details in a register in order to receive you summit certificates. Those climbers who reached Stella Point (5685m) are issued with silver certificates and those who reached Uhuru Peak (5895m) receive gold certificates. From the Mweka Gate you will continue down into the Mweka village, normally a muddy 3 km (1 hour) hike. In the Mweka village you will meet up with your team and bus, and head back to the hotel a long over due hot shower.